Small Changes, Big Results is not about cutting all the carbohydrates out of your diet. Or replacing every single gram of sugar with omega-3 fatty acids. It&#8217;s not about doing one hundred sit-ups a day, or getting on the treadmill whenever you have a free second. In fact, it&#8217;s not about any of the total lifestyle-replacement gimmicks&#8212;whether diet, exercise, or pop psychology&#8212;that have swept our culture in recent years, putting untold millions of Americans on the risky roller coaster of success and failure that defines fad diets and programs. Small Changes, Big Results is about reality&#8212;the reality of what you can do, the reality of what you want to do, and the reality of what works. It&#8217;s about introducing a series of small changes each week for three months in the three core areas of diet and nutrition; exercise and fitness; and emotional wellness. For each of the twelve weeks, nutritionist Ellie Krieger introduces a very finite, completely practical action plan for the week&#8212;and not only are these tasks incredibly doable, they&#8217;re in fact so accessible that it&#8217;s tough not to be inspired. For example, in Week 1 the nutrition task is merely to go shopping, buy some healthful pantry items, and start keeping track of what you eat; the exercise consists of taking three twenty-minute walks; and the wellness aspect is to do a five-minute breathing exercise. That&#8217;s it. And it doesn&#8217;t really get any harder. But these small changes do in fact lead to big results. At the end of twelve weeks, a totally unhealthy diet has been overhauled: armed with easy, delicious recipes and tips, you&#8217;ve removed unhelpful munchies and replaced them with healthful snacking, you&#8217;ve cut down on lethal trans fats while adding beneficial fat choices, you&#8217;ve replaced refined grains with whole grains, you&#8217;re eating more fish and less red meat, and so forth. Yet you&#8217;ve never been forbidden to eat a single thing: instead of prohibiting entire food groups, Ellie categorizes foods as Usually, Sometimes, and Rarely&#8212;and now you should be eating more from the Usually choices, less from the Rarely category. Furthermore, you&#8217;ve integrated physical activity into your life, and you&#8217;ve developed a set of tools to help you deal with stress&#8212;you&#8217;re not only eating better, but you&#8217;re also exercising better and feeling better. The beauty of this program is that none of these action steps is remotely intimidating, because they&#8217;re not a full immersion into a totally new lifestyle. Instead, it&#8217;s a series of incremental changes&#8212;removing bad habits one by one, while at the same time adding good ones. 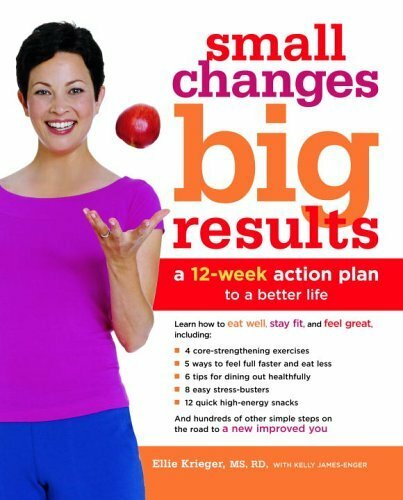 There&#8217;s nothing to scare you off&#8212;on the contrary, here&#8217;s a whole book full of small changes that produce big results. Ellie's book is excellent and quite a relevant plan. Diets don't work, lifestyle changes do! Her suggestions are often common sense, but she offers many, many great ideas for a healthy lifestyle and options for weigh loss and weight management. I truly enjoyed the book and will keep it handy for quick reference. Small Changes, Big Results put my health, nutrition, and exercise goals within reach. Ellie Krieger's style is upbeat and so encouraging - it's like having your own personal life coach! I was inspired to make little adjustments to my daily regimen, and before I knew it I was feeling better than I had in a long time. The basic concept of this book was good. To make small changes in your lifestyle instead of trying to make an unattainable commitment. Too many people go "gung ho" when starting a diet and give up too many foods and try to exercise till they are sore and stiff then give up. This gives you ideas to start out slow and sure. A few months ago, I bought this book. Its easy-to-follow plan with great recipes inspired me to make some small tweaks to my eating habits and life style. I lost weight and found a bit more inner peace as a result. I love many of the recipes and tips. This is a great book. It contains very common sense guidelines and ideas for nutrition, fittness and wellness and organizes them into an easy to follow, step-by-step process. The section on fat is very helpful. I finally understand what all the terms mean (mono-unsaturated, trans fat, etc). Another section on fruits and veggies by color and what they do for you is also well organized and informative. I stumbled upon this book at the library and after taking pages of notes, decided to look it up on Amazon. Sure enough it was selling at a great price so I bought it and have been marking pages and highlighting passages ever since I received. It will make a great gift this Christmas for several people. I found the book enjoyable to read and easy to follow. Her tips are good and I especially found using the pedometer and heart monitor gave my work outs a better edge. I knew where my heart rate was during work outs and could see how much a little more made a difference. For anyone just starting out with a lifestyle change this is a very good start. It will help you change your lifestyle step by step with a possitive and realistic attitude. Most people dont go from being a couch potato to living at the gym over night. Its a process that doesnt happen over night for the majority of people that are in need of life changes. This book will realistically help you get on your way to a better lifestyle. This program is not for people who have serious weight to lose. It is okay for people who just need a moderate eating plan for moderate weight loss. For all of us who need to lose 50+ pounds....get another program. I have read this book twice and love all the practical tips that encompass all aspects of well-being. Ellie has a great way of presenting her information in clear and concise terms and it is an easy and even fun read! It gets me motivated to do more and continue down the path I have started several years ago. She covers all levels of fitness and lifestyles and current 'status' from those just rolling off the couch and knowing there is more to life out there, to those of who have been aiming for a better lifestyle over the years and maybe need some more motivation and sound advise to get all the way there. She writes like a good friend, who has your best interests at heart and knows how to convey it all without a preachy stance. this one to everyone I know. p.s. I bought it online for $6 on Amazon, the best deal yet!